Tonally speaking, I prefer to keep a soft and neutral palette. Whilst we have a dark and moody black wall at one of our living space, the rest is clean and white. Monochrome interiors can come across a little stark, so to warm it up a little choose your decor as natural as it comes – plenty of greenery, a jute rug, pale untreated wooden decorations, cotton and linen cushions (mine are soft pink and grey), and brown paper wrapping for gifts under the tree. It goes without saying that introducing a variety of textures into your homes helps to give your space depth and interest, but at this time of year it’s like you’re being given permission to go crazy. I’m doing just that with extreme chunky knits (give me all the wool) an incredibly luxurious and tactile throw designed by Lauren Aston who hand knits all her own designs, using knitting needles so enormous she had to make her own as they didn’t exist to do the Merino yarn she knits with enough justice. Heavenly, don’t you think? I’ve combined it with a mix of blankets in cream and grey and picked given it a little more depth with a navy blue velvet cushion which plays off well against the soft pink canvas cushions I brought in last year. Although I don’t do shouty decor, I will always have a soft spot for metallics, so I’m mixing brass (this year’s fore runner in the trend stakes) and copper to lift the look and reflect all the candles and warm lighting in the evening. Bust out the candles in all shapes and sizes – church candles en-masse, thin tapers, or standard sticks in soft tones (I’m using a mixture of pale pink, grey and teal this year). 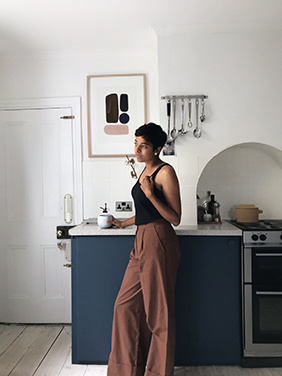 I’m also a real fan of 100% beeswax which purify the air as they burn and have a longer burn time than other candles, so not only do they look great, but they’re better for the environment too. Small fairy and garland lights are standard too at this time of year-goes without saying, right? I have a real thing for mini fir trees at this time of year – they’re ideal if you’re short of space but still want the look and smell of a real tree. 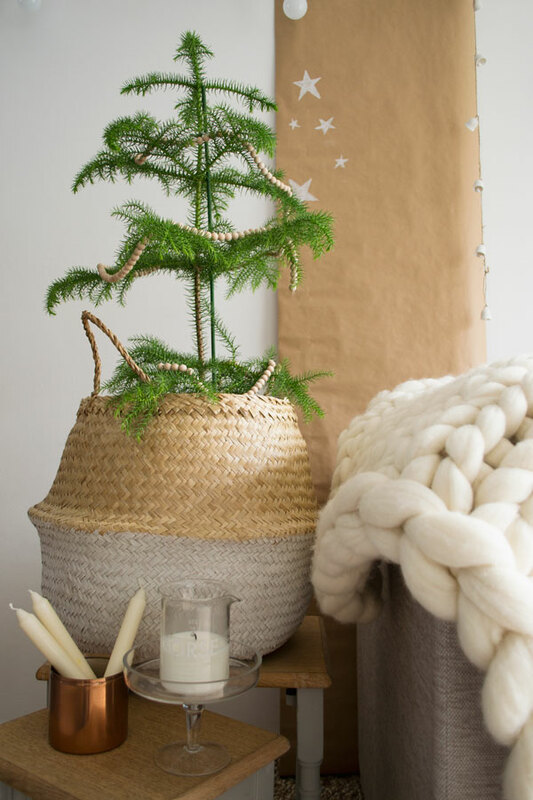 I picked up a beautiful Norfolk Island pine with vibrant, frondy branches to decorate with some simple wooden beads and displayed it inside a natural woven belly basket – I love that it looks barely touched. If I’m honest, if I had my own way, I’d only have a few lights on our tree and leave it at that…but then I’d probably ruin Christmas for the kids who love getting involved with decorating it! You don’t need to spend a fortune on flowers and such either-at this time of year I park at the road side and pick seed heads and berries, any touches from the countryside that are fine to take. Don’t forget to think about scent as another dimension to your styling too. 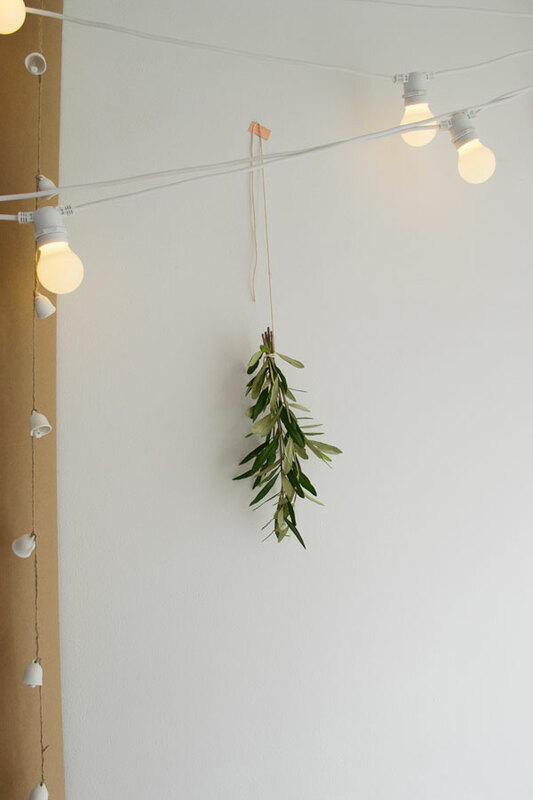 Hanging small bunches of herbs like rosemary from the walls or your ceiling over your table not only look gorgeous but smell so too and for some reason, the “fresh from the garden”, free-form look feels far more homely. 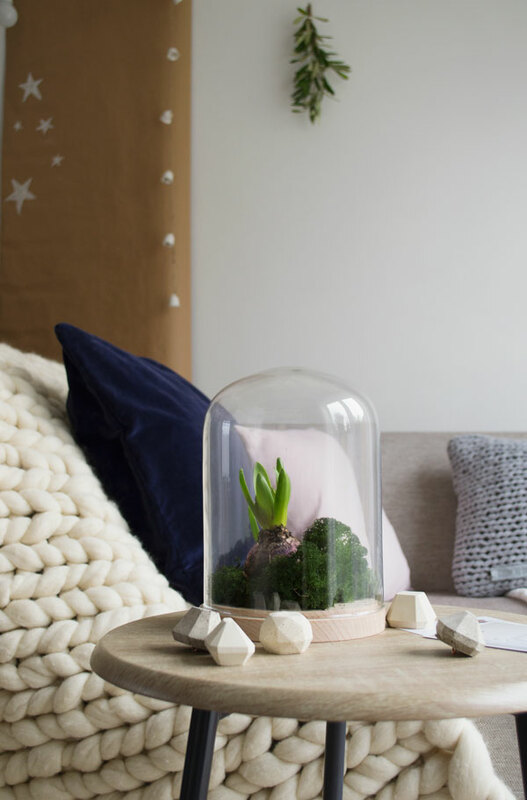 Display bulbs like hyacinths in small vases of water to show the exposed roots or make a feature from one inside a cloche sitting on a bed of moss as I’ve done here. You can pick them up for peanuts (I bought three in a pot from my local florist for around £2.50) and they grow and flower really quickly over the Christmas season with a strong, heady scent. 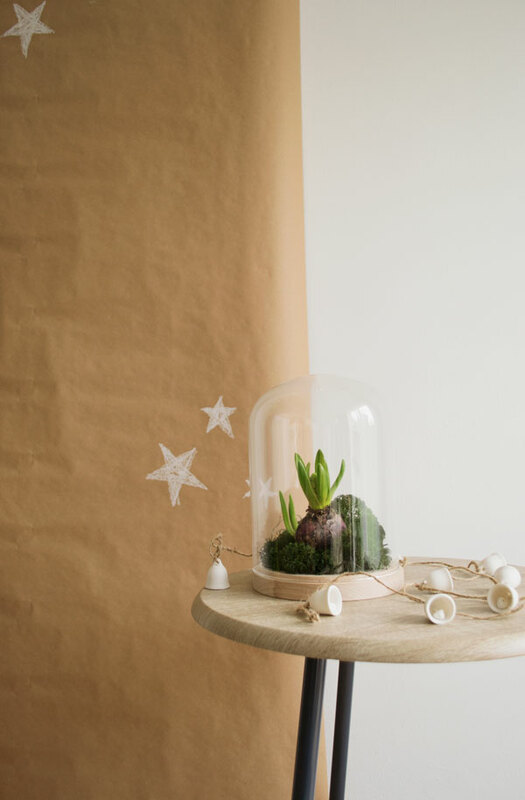 So those are my tips for a natural look this Christmas, just a few easy to do touches to give your space a subtle festive feel. 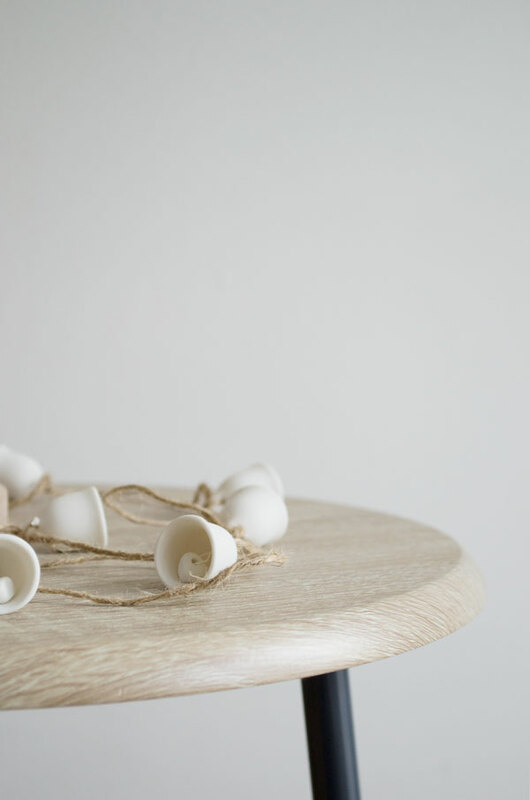 Next week I’m sharing part two with a few simple ideas for informal table decorations (that’s my jam). How will you be styling your home for the festive season this year? Understated, but beautiful! 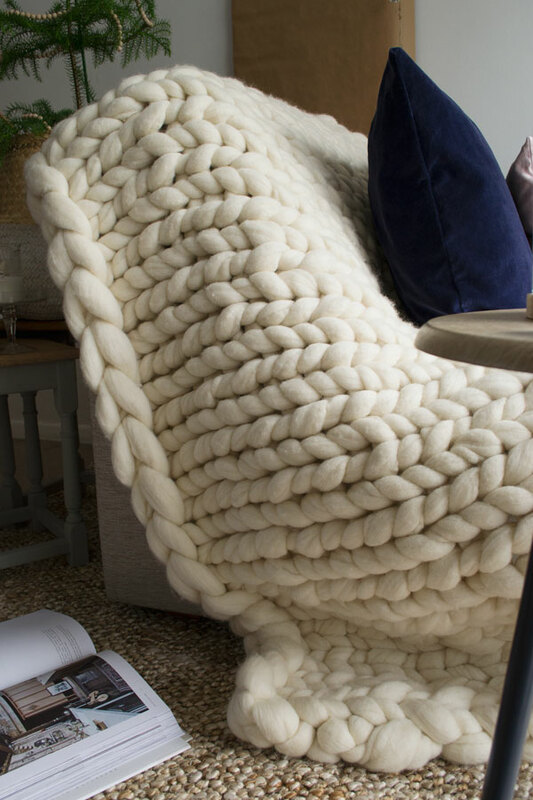 I’ve been admiring the chunky throw for a while, it looks super cosy and soft. I am in absolute awe, what gorgeous and beautiful styling! I NEED one of those blankets in my life! I love that tree in a basket- genius idea! 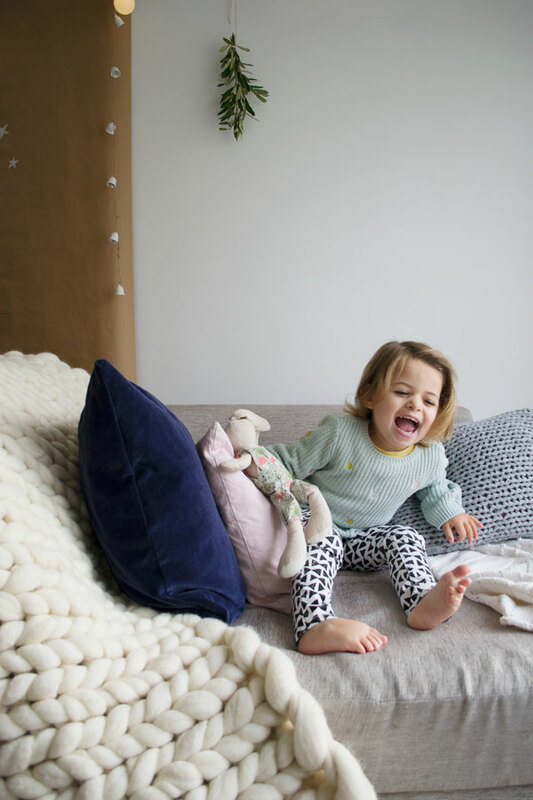 Oh my word, that blanket is to die for. I love a good chunky knit. Perfect for winter. The styling is beautiful too. 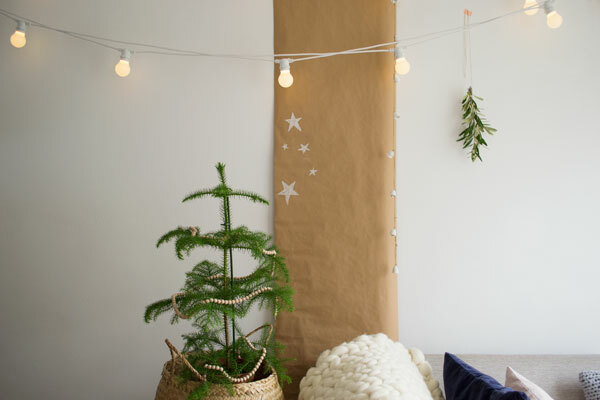 It looks like you’ll have a beautifully serene Scandi Christmas this year.